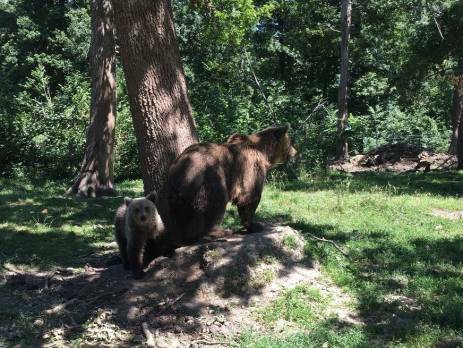 Jessica has volunteered with Oyster on two occasions and this summer she helped out on our Romania Bear sanctuary near Brasov. Her experience shows how rewarding the work done here in Romania is. Not just for the bears but for the community and surrounding environment. Now she has returned, Jessica has written a great blog on her insight at the sanctuary, fun activities and tips for future volunteers. Read on to find out more. Romania is a beautiful country. I wish I had booked a longer trip so that I could explore more of the countryside and cities! 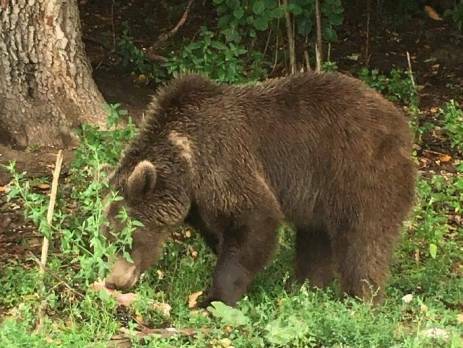 However, I did spend three weeks volunteering at the brown bear sanctuary in Brasov. I am already looking forward to returning. I would highly recommend this project to anyone considering volunteering overseas. Whilst it was a volunteering experience, we had plenty of time to explore the city, visit local attractions (such as castles and local markets), and tackle any additional activities. I booked this project as a solo trip, but I did fly out on the same day as another volunteer. So, I was lucky enough to have a buddy through both airports. That is always a concern for me, but this trip reminded me that they are easy, just follow the signs! However, one of our bags took a long time to emerge on the baggage reclaim carousel. Consequently, about 40 minutes after our plane had landed, the volunteer supervisor called me. He was concerned about where we were and whether we were okay, as our driver was waiting outside for us! This was the first sign for me that the volunteer supervisor was organised and I was in safe hands. He knew what time our flight landed and the driver was already waiting to take us to the flat. With a changeover of volunteers almost every Friday, it must be difficult to keep up with all the timings! Despite the traffic (it was a long car journey, so we slept for most of it! ), we arrived in Brasov in time for dinner. We were taken out to a lovely Italian restaurant where we all got to know each other and were given a brief outline of the project and schedule for the weekends. We were to work at the sanctuary Monday to Friday and had weekends to explore, sight-see and chill. At the sanctuary, the volunteers were needed to sort through the huge quantity of food. It is all donated from local supermarkets and small shops. In addition to sorting, we created ‘ice cream’ by mixing dairy products with dog treats and biscuits. The bears seem to like it! There are very few permanent staff members on site, so the volunteers are needed to sort through the food on a daily basis. The permanent staff are responsible for the sanctuary maintenance, feeding and tours. As it was just the volunteers sorting food, we chatted whilst working. There were four of us, from 3 different countries, so we had plenty to talk about! Just outside the building we worked in there was an enclosure, where Mitsy lives with her cub. Now and again, we’d pause the work and go outside to watch them play. The cub loves to climb trees, so quite often we’d watch him scale up to 30 metres! I was worried that simply sorting food may be tedious for three weeks. But during the days we found different ways to keep it interesting and fun. Working with a number of people meant that we talked, played music, and played games in the down times. We had a great time, and I would readily go back next year! No one is quite sure on the number, but there are around 100 bears at the sanctuary at the moment. Each morning on the walk through the sanctuary, we saw bears playing, sleeping, sunbathing, swimming and foraging. 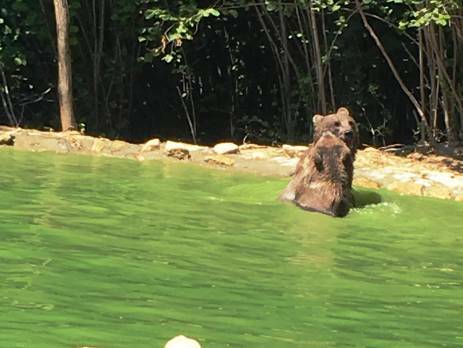 All of the enclosures have a pool for the bears to cool off in during summer. More often than not there was a bear in the pool, or next to it. We began to expect to see certain bears in particular spots each morning. Lidia was always next to her tree stump! During my time on this project, I learnt a few bears’ names, and quite a few personalities. Almost every day we saw Bim and Bam playing in their pool, sometimes with Roc as well (the wolf who grew up with the two young bears). During the feeding tours we went on, we often saw a lot of bears in one place, which was a wonderful sight. Throughout the three main enclosures, enough food is distributed to avoid any tension between the bears. This allows them to share peacefully. This meant that we were witness to as many as 15 brown bears within 20 metres of each other. Some are larger than others due to their past (some had limited space or diet, thus restricting their growth). Yet, seeing so many large, powerful bears so close is very awe inspiring. The permanent staff at the sanctuary are lovely. They have limited knowledge of English, but enough to communicate! We spent some lunchtimes with them, and occasionally worked alongside them. They are great people to work with, very positive and dedicated. 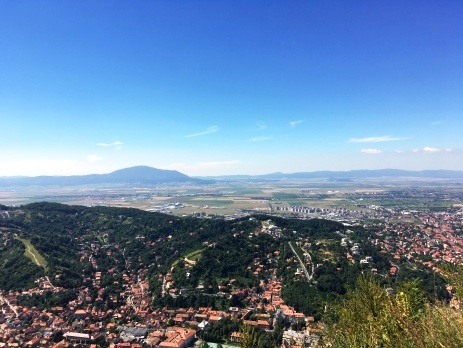 The weekends were spent visiting two local castles – Peles and Bran. The two were very different, but both beautiful in their own ways. It was good to spend some time seeing the local history and experiencing the current culture in the towns. However, the highlight of the weekends for me was the extra activity that I booked – paragliding! The volunteer supervisor booked it for us, due to our lack of Romanian language. We went on our second Sunday in Romania. We had fantastic weather so we could see for miles. Having never attempted anything similar before, I was terrified, but once we had taken to the air, I was speechless. 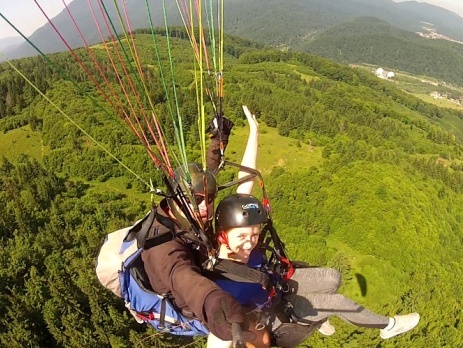 When I go back to Romania, I will either paraglide again or attempt sky diving, which is another option. It was an incredible afternoon, and I have photos to prove I did it! I was sad to leave, as I had thoroughly enjoyed the experience. The people I worked with were great fun, the sanctuary was stunning and I have learnt a lot from the people there. I enjoyed spending time around the bears (and all the rescued dogs living at the sanctuary). The sanctuary felt safe and comfortable at all times due to the support and guidance from the Oyster office and the volunteer supervisor in Brasov. I also made some new friends among my fellow volunteers and am still in contact with them all. Anyone considering this project – go for it! I promise, you will love it. Top recommendation – take a pack of cards. It helps to pass time in the evenings and any slow days at the sanctuary (some days the food delivery comes late). Tip – be prepared to spend more than the recommended money allowance. As I got on well with the group, we went out quite often in the evenings for ice cream or drinks, so I spent more than I had planned. However, being able to spend a little more money allowed me to enjoy our down time more. I enjoyed the combination of volunteering and going out, as I wasn’t limited and constantly checking my money situation. What would I change for next time? I would go out for dinner more, instead of cooking each night. If staying for 2+ weeks, cooking for yourself is definitely cheaper. However, there are a lot of restaurants near the flat, all different styles and worth trying. It is a great opportunity to try new foods and some Romanian dishes. Also, everything is reasonably priced so a meal out is not expensive, even for a student! If you have been inspired to head out to Romania and volunteer with bears yourself, then contact our Animal Welfare manager, Anne at [email protected] or call the office on +44 (0) 1892 770771.